Many are those that join us at Big Day to share their artistry and talent. Sharing is at the core of this event, after all. 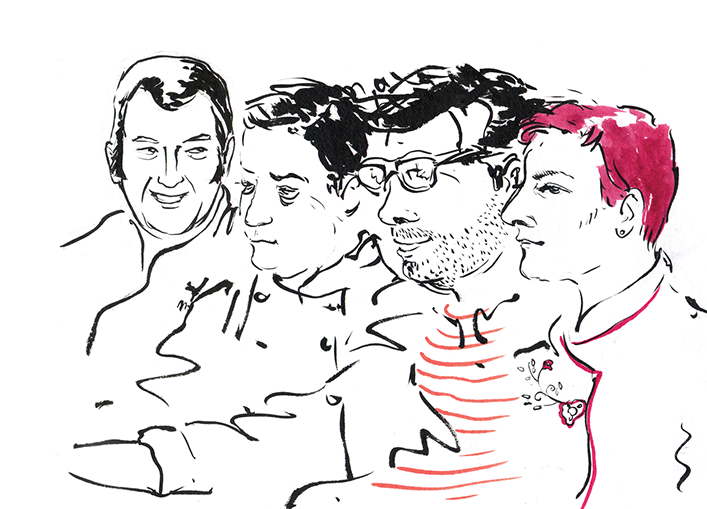 Amongst them, musicians, producers, chefs and artists with whom we identify and that have many stories to tell. Here you’ll discover the guests that helped to make this day even 'bigger'. Born in the hearth of the bohemian neighbourhood that gave them their name, they're the first resident band of MUSICBOX, and one of the newest revelations of Lisbon nights. Passionate for funk and soul, the band dedicates to recreate the sound and ambience of the classics by Motown, Stax, Chess Records and other mytical editors from the 60 and 70, with the dedication and energy of a real celebration. The experience of this group, that brings together elements from Cool Hipnoise, Orelha Negra, Mr Lizard, Afonsinhos do Condado, Sam the Kid band, Spaceboys, Cacique 97, Sitiados, amongst others, guarantee the wisdom needed to the production of the most contagious groove. Ideal to end the night Big. 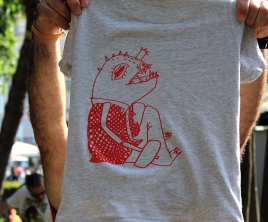 Born in Lisbon, he is a multidisciplinary plastic artist who divides his time as a creator and art-educator. Along the way, Art and Nature are a constant in its ephemeral, aesthetic and poetic presence and, in his work, he follows his permanent desire to draw, guided by the pleasure of evoking creativity and poetry within each individual. Diogo is an enthusiast who sees art as a way to inspire and be inspired, to communicate and to intervene. Broadcaster and communicator of unparalleled sympathy, Inês Meneses has been doing "Fala com Ela" ("Talk with Her") for 10 years on Radar and, in Antena 1, "O amor é ..." ("Love is...") with Júlio Machado Vaz. 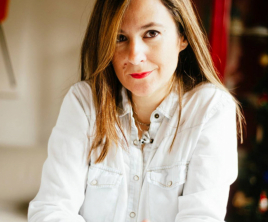 She made gastronomic review on Saturday and signs the "10 Perguntas a..." ("10 Questions for ...") in Revista E. Now, in a Radar / Expresso partnership promotes the connections in PBX, together with Pedro Mexia. This Big Day, she'll be with us to moderate the Talks. Artist, architect and designer who draws visual inspiration from a broad universe of found objects. Porcelain statuettes, miniatures, vintage chairs, toys, diaries and photographs of people she never met populate and shape her creative vision. Her artworks, installations and window displays are inspired by imperfections, mistakes and the irrepressibility of humor. In 2009, created the Studio Astolfi with a team of artists, architects, and technicians who specialize in telling stories, evoking memories, and captivating the curiosity of our audiences. Together they've created projects for Hermès, Belcanto, Bairro do Avillez, Claus Porto, A Padaria Portuguesa, amongst many others. 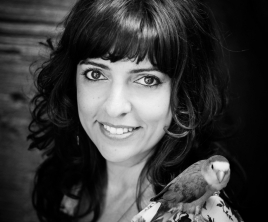 In this Big Day she'll be joining us for the Talks, to share her project "Árvore da Esperança" ("Hope Tree"). Samuel Úria is divided between the rural and the urban: half man half gospel, hands of 'fado' and feet of rock n' role. His career began with author editions, in a career that has generated a growing cult of fans. The culmination of this was his latest album "Carga de Ombros" ("Shoulder Charge"), which critics put in a deserved top spot. He'll come to Big Day to talk about music, during the Talks. He started his cooking course at the age of 14 at the Escola de Hotelaria e Turismo (School of Hospitality and Tourism) in Lisbon. 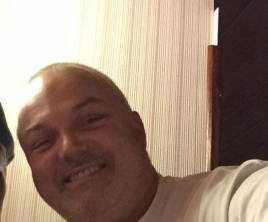 After completing his degree, he entered the Food Production Catering Degree at Esht, where he had the opportunity to practice with Henrique Mouro, at the Restaurant Assinatura and, last year, at the Hotel Claris (5 stars) in Barcelona. After graduating, he started working at the Grémio Literário and later at Rota das Sedas in Lisbon. In 2014 he moved to London where he worked for a year at the Clove Club (1 Michelin star). Back in Portugal he came to work at the Restaurant Herdade do Esporão, where he spent 2 years as a sous-chef. Now, at the age of 25, she takes the lead in the kitchen of Herdade do Esporão. Bruno Caseiro was taken to the kitchen universe by his passion for food. After finishing the Escola de Hotelaria he traveled the world to learn from some of the best: Nuno Mendes, Nuno Diniz, Tom Sellers, Leandro Carreira - always keeping a close eye on what was happening in his country. He likes to cook what gives him pleasure to eat and found in Alentejo the perfect scenery, where time stretches and prolongs, in lively evenings and full tables. He seeks to reflect in the dish and on the palate the biodiversity that characterizes the region. 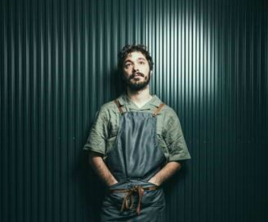 António Galapito, 27 years old, returned from London especially to open the Prado, a restaurant that offers dishes with national, seasonal and fresh ingredients. 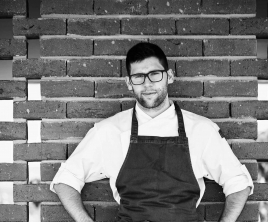 In London, he worked in several renowned restaurants, two of which were awarded with Michelin Stars: 'Viajante', 'The Corner Room' and 'Taberna do Mercado', by Nuno Mendes, and 'Lyle's', by James Lowe. Hugo Brito began his training in Sociology and Fine Arts. He was a Fellow of the Gulbenkian Foundation and made numerous exhibitions, both in Portugal and internationally. In the midst of a post-graduate degree in visual arts, in Amsterdam, he began working in gastronomy and, initially without that intention, he eventually made of it his profession. 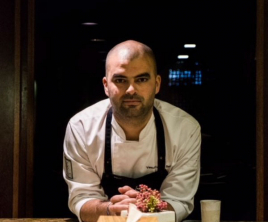 He worked in numerous restaurants in Amsterdam, London and Lisbon before opening, in 2014, the Boi-Cavalo restaurant in Alfama, which he defines as a relaxed restaurant, but politically and culturally committed. He has a 4-year-old son who likes 'farinheira' a lot and many plants at home. 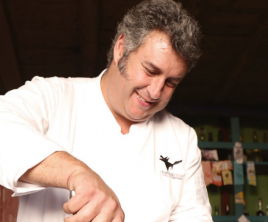 Born in Portalegre, he is passionate about the countryside and traditional and regional cuisine. Self-taught, he made his way studying techniques and products that allowed him to develop a simple kitchen like the regional one, but full of charisma. He has the TombaLobos restaurant for 18 years, in Portalegre, where he creates dishes always respecting the seasonality and the origin of the products. Also in Portalegre, he opened the tavern Boca do Lobo, where he recreates and presents his snacks. 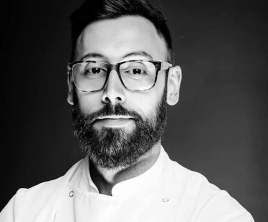 He is a consultant chef at the Hotel São Lourenço do Barrocal and is in charge of the kitchen of the new project in Lisbon - Pica Miolos, at Cais do Sodré -, opening this year. Before he clung to the pots, he was an architect. It was when Leopoldo returned to Lisbon, after six years of practicing in Alentejo, that he decided to enroll in the Escola de Hotelaria of Estoril and 'architect' a change in his life. The past seasons in constant contact with Alentejo gastronomy and an old passion for the kitchen were the basis of the decision. 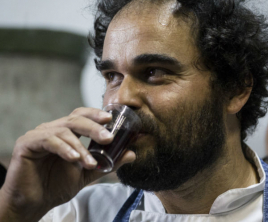 In 2014, after gaining practice in other restaurants, including Belcanto, he opened his first restaurant, the Sociedade, in Parede, where he was when he accepted the invitation of the D. Maria II Theater, in Lisbon, to have his space there. Regional food is the daily dish at Café Garrett: "I find it funny when they say that I do Alentejo cuisine because the idea was not this, but the truth is that the Alentejo always comes to the plate." The detail is essential to understanding his personality, as it manifests itself in everything in his life. Rui Martins is a strong spirit, always feeling that life is to be lived intensely. The kitchen inspired by different regions of our country and in his journneys, is a kitchen full of contrasts. 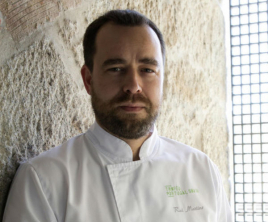 He participated in the TOP CHEF in 2012 reaching the final, received the Trophy 'Portugal Sou Eu' in 2015 and the distinction 'Chef Cook of the Year 2016', and worked in the Celler de Can Roca - with 3 stars Michellin and considered the 3rd best restaurant in the world. He believes that sharing and the experiences with colleagues are moments of constant growth, and that the demand has to be constant - those who do not look, hardly find. It was without fear, with only 29 years and a baggage already full of experience and inspiration, that Vasco Coelho Santos opened the Euskalduna Studio, in Porto. As a good son, back home he came after some years travelling the world and building his knowledge in Lisbon, the Basque Country, London, Singapore and Japan. He learned with the best and came back wiser. But with his feet firmly on the ground. His humility enables him to imbue a little of each place he visited in his identity as a chef. Joaquim Saragga Leal graduated as a mechanical engineer in England. 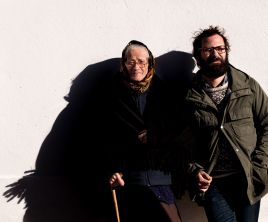 After some years working between Volkswagen and as a helicopter mechanic, he eventually went to work in Alentejo, at his grandmother's property. It was at this time that he entered the University of Bordeaux to take the DUAD (Diplome universitaire de aptitude à la degustacion). In an act of curiosity and encouraged by friends, he entered the cooking course at EHTL. After finishing it, he continued on to the master's degree in Gastronomy Sciences, at FCT / Nova de Lisboa. After finishing the first year of the master's degree, he acquired the number 22 of Calçada do Forte in Alfama, where he opened the Sal Grosso tavern and amuses himself between Portuguese gastronomy and artisanal beer, his latest project. Following and deepening the footsteps of Michel Giacometti, Tiago Pereira is possibly the ethnographer who knows Portugal better. His project "A Música Portuguesa a Gostar Dela Própria" is a hymn to the pride of our customs and traditions. The success was such that now he's also doing a survey of our gastronomy - a theme that brings him to Big Day. 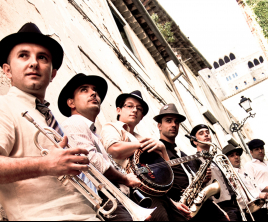 Desbundixie revive the jazz style called Dixieland, seeking inspiration in the sounds born in New Orleans and that captured the imagination of the whole world. Composed in its base by seven elements - Manuel Sousa (trumpet), Flávio Cardoso (clarinet), César Cardoso (tenor saxophone), Ricardo Carreira (trombone), Pedro Santos (tenor banjo), Daniel Marques (tuba), João Maneta (drums) -, this project presents written themes of the period, orchestrated by these musicians. Desbundixie is much more than a name, it is a special way of living the music. It is the brand image of this band, which wants, above all, to animate itself and to animate who hears it. In concert, the seven elements propose a journey marked by a language full of improvisation and irreverence. They asked a Syrian student living in Lisbon what she missed the most. She replied: "Syrian bread!" 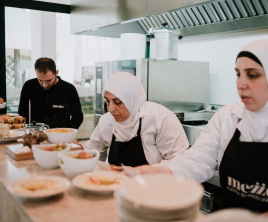 This was the starting point for an absolutely pioneering integration project in Portugal: an Arab food restaurant, the Mezze, where training and employment are given to refugees from the Middle East. Because bread is one of the elements that connect us to home, Mezze is a space where bread is produced as well as several of the dishes that accompany it. It is much more than a bakery and much more than a restaurant: it is a meeting place and a place of sharing. 'Pão a Pão' association thus generates solutions for sustainable employability and contributes to a true inclusion in a model that they intend to replicate in various parts of the country. And because integration is a bidirectional process, they also organize workshops and debates, which help to approximate, reduce ignorance and eliminate prejudices. Natural of Caxarias, county of Ourém, he was a Philosophy professor until 2014. Self-taught aerophones researcher, he's now the maker of bamboo flutes (bevel and transverse, whistles, cuckoos and plunger flute) and other bamboo artifacts (boxes and tubes for storing flutes, flares). He's coming to the Big Day to share his art with the youngest in the Instrument Construction activity. After studying at the School of Dance of the National Conservatory, he established himself as one of the most prestigious dancers in Portugal, collaborating with groups and dance studios such as Utero or Les ballets C de la B. Their interpretations (which also extend to the representation) have garnered public praise and criticism from around the world. One of the most important disseminators of Portuguese musical traditions, he has focused his activity on wind instruments, such as bagpipes. 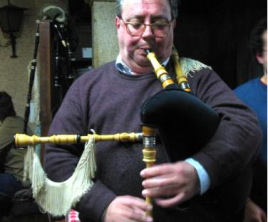 For Big Day, he reserves us a telluric performance with the bagpipe. 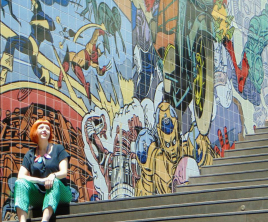 Inês Leitão studies the contemporary tiles applied in public space, having some chapters of books and articles published. 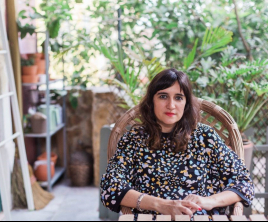 She is a researcher at ARTIS - Institute of Art History of the Faculty of Arts of the University of Lisbon -, integrating the group Az - Tile Research Network -, where she develops her PhD thesis as a grant holder of the Foundation for Science and Technology. In 2016 she obtained a master's degree in Art, Heritage and Restoration Theory by the same faculty, with the dissertation entitled "Public art and the construction of the place. The presence of the tile (1970-2013) ". She also integrated some research projects, namely the "Az Infinitum - Tile Reference and Indexing System" and the "Off-Off Lisbon: Urban Alternative Narratives", and the permanent team of the monthly "AzLab - Tile Studies" seminar.